(Adapted from a recipe in “The Great Salsa Book” by Mark Miller, Ten Speed Press, Berkeley, California). Husk the tomatillos and rinse well. Place under broiler and turn frequently until tomatillo skin is blackened over 20-40% of its surface. Remove one by one as they finish and let cool slightly. Broil the garlic clove until evenly browned similar to the tomatillos above. Place the tomatillos, salt, sugar, adobo sauce, and garlic in a blender and puree. Make sure the tomatillos have cooled slightly, start slow, and hold the blender lid down firmly, or steam expansion will paint the kitchen with the blender contents. 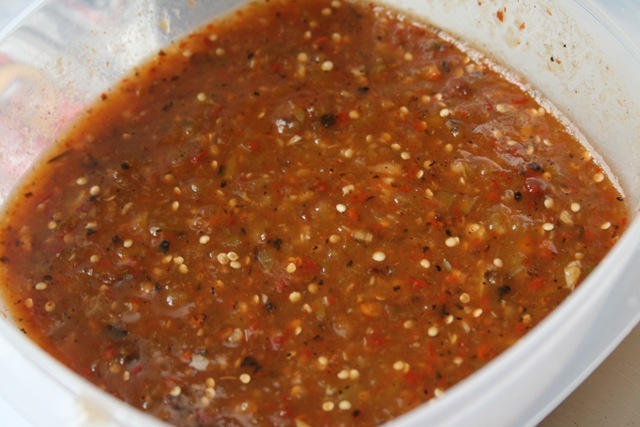 Add the chipotle chiles and blend briefly, leaving some texture to the salsa. This sauce is best served fresh while still slightly warm. It will keep in the refrigerator for 2-3 days though the sauce tends to gel somewhat, losing a bit of its texture.